The LOB group of Theo Lasser at EPFL recently developed a Superresolution Optical Fluctuation Imaging (SOFI) method, which allows recording of high temporal and spatial resolution 3D video sequences. 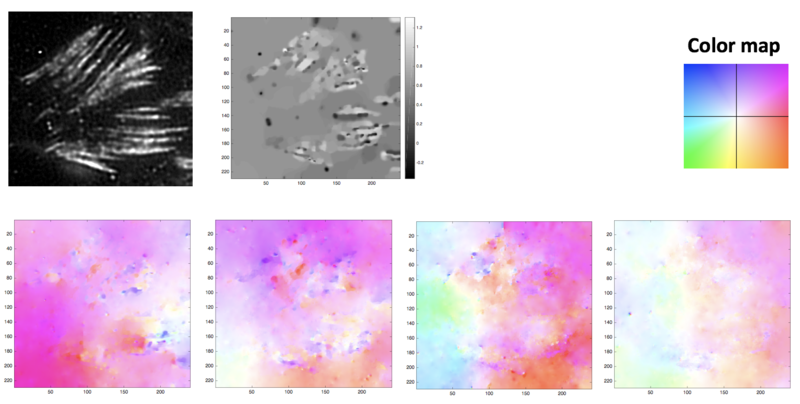 SOFI images, similarly to STORM images, are based on the analysis of stochastic temporal fluctuations of fluorescent dyes. Biologists are interested in quantifying cells deformation based on SOFI images to develop a tool for early diagnosis of specific diseases. In this work, it is proposed to use optical flow methods to quantify the displacement of actin filaments. However, a general characteristics of bio-sequences recorded with fluorescent methods is the decrease of the intensity over time due to the bleaching effect. This is highly problematic since the focal point for optical flow estimation is the intensity constancy constraint. Consequently, the goal of this project was to develop a new approach for optical flow estimation under bleaching conditions. The first explored approach is based on the use of an operator insensitive to additive intensity changes: the gradient operator. However, the bleaching is mainly a multiplicative change of the intensity. In the second approach, the bleaching effect is explicitly modelled by introducing a multiplicative term. While the two first approaches consider only two frames of the sequence, the last approach bases the bleaching effect estimation on the whole sequence with a physical model of bleaching: an exponential decay. For two successive images suffering of bleaching with 30% attenuation (the attenuation estimated on a real 2D biological sequence), the multiplicative model showed to be more efficient compared to the gradient intensity approach. Moreover, for five successive frames, the exponential model of bleaching allowed a much better estimation of the bleaching effect, which leaded to a better optical flow estimation compared to the multiplicative model. Finally, the exponential model approach delivered a coherent estimation of the optical flow when tested on a 2D biological sequence.